The perfumes that celebrities wear are a topic that seems to fascinate many. For a perfume-addict like me, a person who spends a lot of time thinking and reading about perfume, the term “celebrity” includes not just actors, singers, politicians and other “typical” kinds of famous people, but also perfumers, creators of fragrance lines and perfume experts and writers. In fact, this perfume nerd is much more likely to be all aflutter, star-struck and tongue-tied having accidentally bumped into say, Maurice Roucel or Lorenzo Villoresi rather than say, George Clooney or Bill Clinton. And while I am mildly curious to know what perfume the said Clooney, Clinton or even the much-admired Catherine Deneuve wear, it is far more interesting for me to find out about the favorite fragrances of the perfume stars. So this summer I decided to gather my courage and to talk to some of the most fascinating people in the perfume industry, about their warm-weather favorites. As a bonus juicy tidbit, I also asked them about their preferred holiday destinations. In the course of the next couple of weeks I will be posting the answers. Today is the first installment. I hope you enjoy reading the feature as much as I have enjoyed preparing it. During the summer time, I love to splash my neck and my shoulders with some very citrus fragrances like : "Eau de Fleurs de Cedrat" from Guerlain, "Eau Sauvage" from Christian Dior, "Eau d'Hadrien" from Annick Goutal, and my sparkling "Lux" !!!!! “If I had to pick a summer fragrance, I would definitely go towards something flowery and light (not very original a statement, sorry!) which would fit an outdoor, natural, sunny, free, relaxed way of life. “Now a tough one, my favorite summer destination...the mountains! As far as possible from the elegant fashionable quarters of Paris, and the subtleties of the world of fragrances. 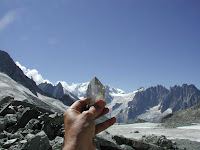 I love to be alone or with a good friend, on the glaciers of the French Alps near Chamonix, near the Mont Blanc, for two or three day long hunts for crystals; the mountains are so spectacular, so beautiful, so pure, it is like a spell which draws me year after year to these not always very friendly spots . Just magical. The search is as exciting as possible, a bit dangerous but the rewards are priceless in terms of what a find means and all the memories that go with it. This is my way to forget about Paris and its notorious traffic jams. Other favorite destination - a bit more conventional- the beaches with my daughters and patient wife! Images courtesy of grasse-riviera.com, monadiorio.com, lorenzovilloresi.it, Claude Marchal. What an incredible post! I find this stuff positively fascinating!! I could read this stuff forever. Marina, you're a rockstar for getting this!! Marina, you're brave and, yeah, Kayliana is right: you're a rock star. A lot of those vacations sound like fun, don't they? If it weren't for my acrophobia, the French Alps one would be especially enticing. Okay, but here's what I'm dying to read about: your and Ina's adventures perfume sniffing in New York! Bravo! This is wonderful post and wonderfully fascinating. I must say the scent of Monoi (specifically the Yves Rocher brand)always will remind me of the summer I spent in France, it is what my grandmother always wears. A thousand kudos for this great post, Marina. Fascinating and so new - I truly enjoyed this, and am looking forward to all the further installments. So funny to see them all plugging their own scents - hopefully, some of them wear the classics, too! Good on for Mona di Orio for mentioning Guerlain et al: I haven't tried her scents yet, but I was under the impression that her marketing was kind of arrogant or self-aggrandizing - I heard this mentioned before - so this interview was a pleasant surprise. Oh, to be in the south of France! This is wonderful!! I am in awe of you for doing this! As everyone said, YOU are the real star!! It's very interesting to read their choices, but I must say I have the most respect for those that at least mentioned fragrances other than their own! This is great stuff, Marina! Thanks for making the effort to contact all of these perfumers. Fascinating to see how their personalities come out in their answers to your questions. Marina, what great fun!! I agree with you, give me Pierre Bourdon over Harrison Ford, any day!! great interviews, looking forward to reading more, thanks! Great post. Yes please Lorenzo Villoresi, come and visit Tasmania.This is a truly unique place and I just wished our polititions appreciated it as much as we residents do. Thank you, I am so glad you enjoyed the post! The NYC report is coming tomorrow! Thank you. I too think that Monoi is very summery. Such a fun post, thank you for doing this, Marina! There will be more mentions of classics coming in the next posts. 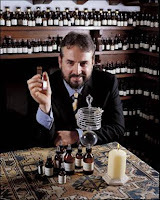 I also found it interesting that some of the people I interviewed think in term of essences/single notes/ingredients rather than actual perfumes. I want to meet him too! I also think that it is natural for perfumes/perfume line creators to mention their own scents, and not just in a sense that it is marketing, but because they live and breathe (pun not intended) the stuff they create/produce. You know, I find that the headiest florals are the best in summer. They blossom on my skin in the heat. Tuberose is like that and gardenia. Yeah, I think "perfume nerd" fits me the best, even more so than the more chic sounding "perfumista" :-) Plenty of room on the bench, make yourself comfortable. Brilliant! Bravo! now THIS is the kind of "what do you wear?" article I've always hoped to read. At first I just figured that their favorite summer fragrance part would just appeal to "perfume nerds" and make them long for the smells ... whilst making me long for a holiday! But their decriptions of the smells AND the locations were so well done that enjoyed the whole thing! They are all extremely creative people. So it probably shouldn't have surprised me they'd have such a way with words. And I guess often it is that a gifted person is gifted in more than one area. Lovely post M! Cracked up at "arrogant chauvinistic good looking French men". Great post - loved Mona di Orio's (I'm assuming) playful use of apostrophes after her mention of Lux. It's a shame her advertising and PR comes across as self-aggrandising in the saturated market - James Craven in Les Senteurs says she's a delightful person to meet and talk with and, well, I'm a massive fan. Colombina, Mistress Fumetastic, I salute you! You know, I fell in love with Nuit Noire the moment I smelled it (before there was even any info on the line) and ever since I am inclined everything di Orio does or the way she does it :-) She does seem incredibly nice, judging my email communication. fascinating- and I am looking forward to reading more..
Well, I got round to NN a little later than you but it's one scent I was instantly addicted to. saving my pennies for a big ole bottle and, though I'll probably rarely wear it, Oiro too. Carnation is the only one that doesn't work with me, even though I like it. Good on you! What a great idea, and how wonderful to bring it to reality. It's just exactly right for all of us who wonder if these people are real, and then to discover they have memories and scent affinities. Perfect article! Thank you! I too loved the fact how the answers sort of turned the names into real people. Fascinating! This does make these perfume stars more real and accessible. ;D Can't wait for more. This was incredible to read...sensual , satisfying perfumed erotica. I adored it! Thank you Marina , for sharing such a delicious adventure with us! LOVE this series!!! I'm so w/ you in being far more interested in what perfumers wear than what typical celebrities wear. And CM? Could the man possibly be more perfect?